Clam Bayou, Gulfport Marina and Gulfport Beach were closed last week in the wake of Tropical Storm Colin due to sewer discharges into Boca Ciega Bay. 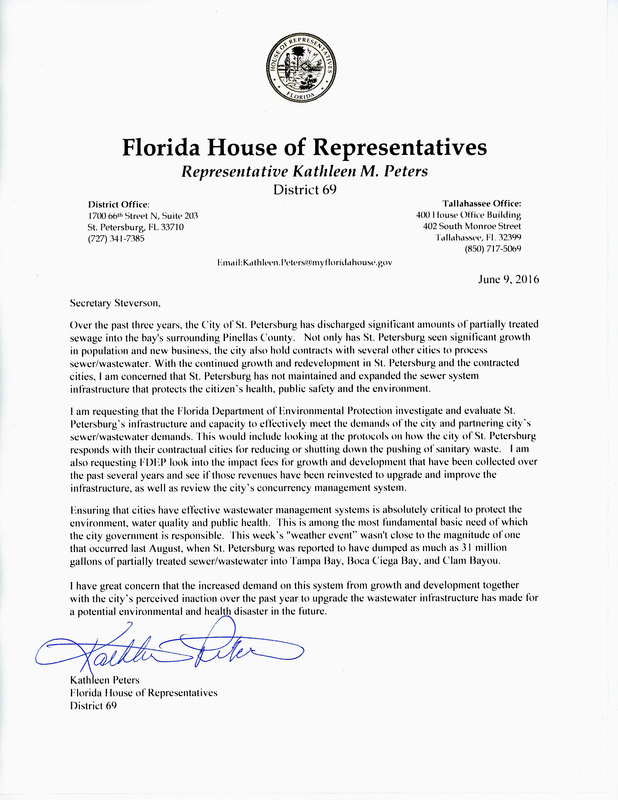 St. Petersburg is under investigation by the Florida Department of Environmental Protection regarding how it handles its sanitary sewer system during “rainfall events” thanks to an advocacy letter sent on June 9 by State Representative Kathleen Peters, R., District 69, St. Petersburg. Specifically, they have some explaining to do to regarding a “pattern” the agency has noticed relating to sanitary sewer discharge and bypass issues into area waters, including Clam Bayou. Peters, also a former mayor of South Pasadena, says she sent the correspondence two days after Topical Storm Colin deposited from 2 to 10 inches of rain in areas that it covered according to the National Weather Service, which stressed the sanitary sewer systems of multiple municipalities in southern Pinellas County to the breaching point, including those in Gulfport, St. Pete Beach and St. Petersburg. As part of regional cooperation and under the correct circumstances, overload sewer water can be purposefully diverted by pipe to St. Petersburg, which has sewage treatment plants, or trucked to nearby cities that have extra storage. When area sewer systems go beyond capacity, liquid sewage in various concentrations is often spilled into area waterways as manhole covers blow off. Peters and others started taking greater notice of area sanitary sewer issues in 2015 when, according to FDEP records, a multi-day rain event in July and August forced St. Petersburg to route “untreated wastewater” from one of their overflowing reclamation facilities into Clam Bayou, a 170-acre estuary located between St. Petersburg and Gulfport. This intentional release into Clam Bayou motivated the city of Gulfport to initiate a Memorandum of Understanding for Wet Weather Communication Protocols on May 18, 2016 with the city of St. Petersburg, an agreement that would formalize a process between the municipalities when future rain events could cause issues with sewer systems. On June 7, 2016, after Colin struck the area, the new document inspired communication. “They followed their protocol and I’m really glad to hear we followed ours,” said Gulfport Mayor Sam Henderson during a city council meeting on June 7. Not every Gulfport city council member agrees, however. Gulfport City Manager Jim O’Reilly said at the council meeting that St. Petersburg had advised them of only one. A June 7 report to FDEP filed by the city of St. Petersburg and timed at 8:35 a.m. said it reported 57,750 gallons of wastewater flowed into a storm drain that led to Clam Bayou. This was due to a manhole cover being blown off as a result of pressure in the system. At 10:45 a.m., a St. Petersburg official notified the city of Gulfport of the issue, O’Reilly said. During the tropical storm, St. Pete Beach had sewer issues of their own that led them to first divert sewage water into Boca Ciega Bay, then on to St. Petersburg. “By late morning, St. Pete Beach was sending all of their flow to St. Petersburg,” said Benjamin Kirby, communications director for St. Petersburg. According to city officials, the strain of dealing with their own system and taking water from a neighboring city led St. Petersburg to discharge partially treated wastewater into Tampa Bay. Peters agrees and has helped area municipalities like Gulfport and St. Pete Beach with state funding for their priority sewer projects. She is prepared to do the same in St. Petersburg once the FDEP completes their investigation and the city formulates an action plan. All they have to do, she says, is ask. As an example, in a 10-year plan, a “reasonable” request for state funding that could help address priority areas of their sewer system would be up to $30 million over a three-year period, Peters said. Rainfall from Colin in June 2016 put stress on many regional sewer pipes that are leaking and crumbling from age, Peters said. “I wasn’t specific in my letter that I want [the FDEP] to do all of the cities” in the region that depend on St. Petersburg to process sewage at their plants, Peters said. “I will be following up with FDEP on a regular basis. I will support [St. Petersburg’s] plan but I want to make sure it meets the needs of the entire system.